Pauked.com » British Summer Time? My arse, it might just be! British Summer Time? My arse, it might just be! This was the view from the office today. 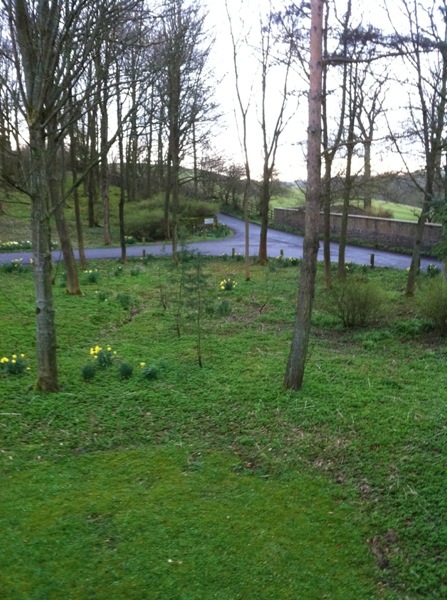 A slightly damp but green looking patch of woodland somewhere in North Yorkshire, with Spring on the way. My Apple addiction has well and truly took hold. From an iMac, a MacBook followed, along with a couple of iPhones and an iPad. Nothing quite compares to Apple gadgets. In the meantime Windows 7 popped up and has made the land of PC’s somewhat pleasant again after Vista’s excrement shaped attempt. Almost tempts me into getting one to play Portal 2, but I’m still addicted to Xbox and I’ve got it pre-ordered for that… Dead Space 2 is currently consuming a lot of my spare time! Formula One still entertains. Not entirely happy with the previous two World Champions, Button and Vettel. Still deep down rooting for Alonso to blitz them all. Will this year be it? Not so sure, those Red Bulls are damn fast. It’s gonna be great watching though. MotoGP has certainly been interesting. Not so sure Rossi will conquer all at Ducati, as much as I would love him to. Lorenzo is just too good on that Yamaha and Stoner looks ominous on the Honda! Still, it’ll be a cracking year before the 800’s take a bow to be replaced by the 1000cc’s. So yeah, pretty busy! Will I blog some more? Perhaps ;). I’m completely on your road. Macs for work, Xbox for gaming. In fact I am like you but without your C knowledge and the cats. Oh and the woodland because here in Sunny Spain is too hot for that. But yeah. Have you considered learning some XNA? Would be nice if you use your programming knowledge to do something useful like a videogame. Think on minecraft. Bucks! The Mac’s are at home since work is all Windows. It’s a nice bit of sanity after leaving work. I have thought about XNA, but I’m more tempted to learn Objective C and do some iPhone and iPad programming. XNA does interest me, but I have no idea where to start with games programming (like a good idea for a game for a start!). I’ve not looked back at PC gaming really since getting an Xbox. My work laptop can play the odd game if I’m interested, but the whole console thing of buying a game and whacking it in without having to worry about “Do I have the latest graphics drivers?”, “Do I have enough memory?”, “Must make sure to turn antivirus off when this runs!”, etc, is just great. Thats exactly the reason why I love my console too. Black Ops? Sure! Dead Space 2? I’ll get it! Gears 3? Pre-order! No worries about AGP aperture or how much gigaflops of Argosel will the damn latest technomadness will require. iPhone is a good idea. A year ago was much better, too many big houses on the development already, but still a lot of place for good ideas (check Game Dev Story). Yeah, there is that with iPhone stuff, but that always happens when something takes off. There does seem to be a lot of one man bands doing alright with apps. I think it’s a case of executing a good idea well. About a game idea, if we can work out how to persuade The Vondur, I’d be up for that :).